In my last article, entitled Understanding Vega, we examined how Vega measures the changes in option pricing relative to changes in implied volatility. In today’s article I will delve a little deeper into volatility and its impact across the options chain. There are actually two types of volatility that option traders need to understand: Historical volatility and implied volatility. Historical volatility measures the movement of an underlying security over a specific period of time, typically one year, and is expressed as a percentage. It is recalculated with new prices each day. 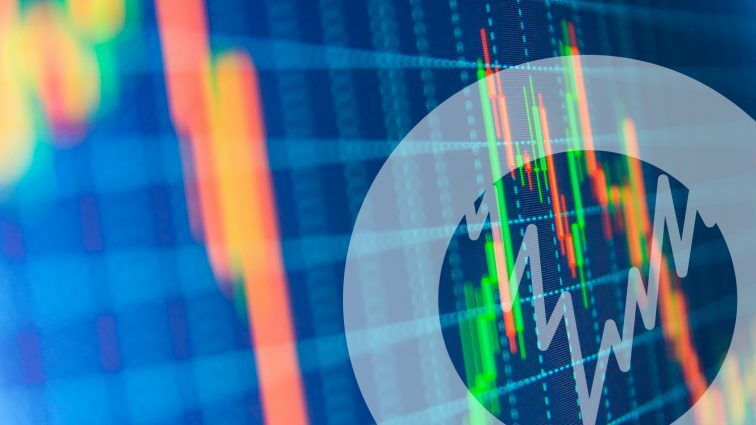 Investors often examine these past trading ranges to give them some insight into how much the underlying price may or may not fluctuate in the future; understanding that the historical price movements are not a guarantee of forward price. Historical volatility is a measure of that stock-price fluctuation. Standard deviation, another term investors should know, is a measure of how widely dispersed stock prices fluctuate from the average price. In this example a 1 standard deviation move for a single day would approximate 76 cents and therefore XYZ would expect to trade from $49.24 to $50.76. Note, there are approximately 252 trading days in a calendar year. Now, let’s examine distributions of three stocks each with different volatilities. The mean price ($100) is identical for all three stocks, however, the greater the volatility, the greater the range of prices. The stock, which experiences extreme price movements, will have higher premiums for options. If we think about this in the insurance world, we understand that higher volatility means higher insurance premiums. A homeowner in a flood zone (more volatility) is going to pay higher premiums for home insurance then the homeowner outside that zone. In the same vein, two teenagers driving the exact same Honda will have different insurance rates based on their historic driving records. Implied volatility is the market’s forecast for the future movement of the underlying. It is reflected in the option premiums of puts and calls on the underlying security. Implied volatility reflects the supply and demand for each of those options. Most traders active on the floors prior to 1987, myself included, lived under a false assumption that calls and puts at the same strike should trade for exactly the same price. What happened during the crash of 1987 changed forever the skewness of options. What everyone learned from the crash is that markets accelerate to the downside with much more velocity than they do to the upside. This made out-of-the- money puts more valuable than out-of-the-money calls. In addition, the advent of covered call strategies, managed both institutionally and individually, helped to push call option prices down, while the needs for portfolio protection pushed put prices upward. 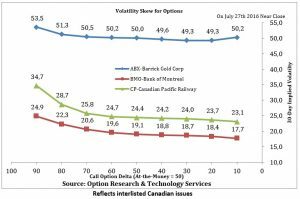 When we look at options volatility skew, we are looking at the differences in implied volatility across the options chain. The implied volatility will differ between out-of-the-money options, at-the-money options and in-the-money options and across differing expirations (Time skew). To see this in real time, go to the options calculator and pick any stock and look at the implied volatility differences between these options. If we were to graph the differences in the implied volatilities, we would get a smile or more accurately a smirk. The volatility smirk reflects higher implied volatility as options move more in-the-money or more out-of-the money. While pricing models and the statistics accompanying them can be very useful, they are not 100% accurate. There are several models available, all serve to give you guidelines. Know the risks and rewards of each trade you make, and most importantly of all, always have an exit plan!